I've been oohing and ahhing over big, chunky statement rings ever since picking up that one in the center at an artists' market in Tel Aviv. It reminded me of the YSL Arty Ring I had been coveting for so long, and at a fraction of the price, there was no question that this ring would be my vacation souvenir. While the Arty Ring remains a favorite, I have to admit that it's become a little... ubiquitous. Flash that bauble at a fashion party, and everyone will know exactly what it is.Why not go for something just as beautiful but less identifiable, like one of these? The turquoise ring is spectacular! I want that lime greenish one on the right! 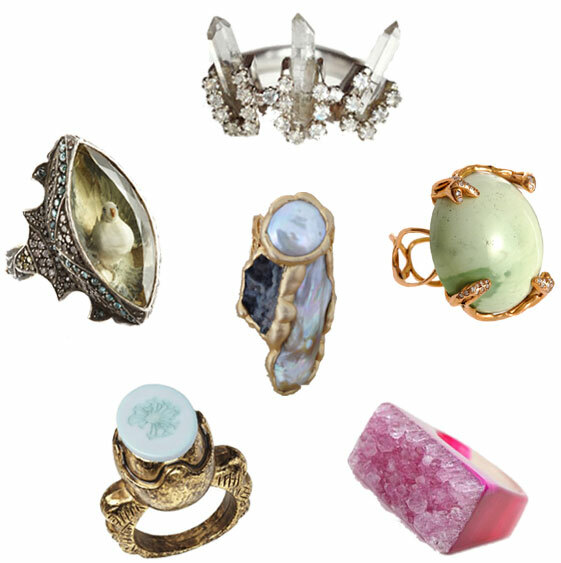 Love the scotch and soda ring, all beautiful picks! Love the one with the little bird!